We have all read about how important it is to save money for an emergency fund, monthly expenses, or investments - though it sounds easier said than done, and many of us have been unable to successfully manage our income in a way that allows us to create all of these funds. It is very easy to overspend or forget about starting a savings that will help our financial situations in the long run. Following a structured plan is a helpful way to break bad spending habits and to do away with financial fragility once and for all; to do this appropriately, you will need to set up at least two savings accounts and one checking account. You will also need to come up with an investment plan such as a Roth IRA, 401K, or dividend portfolio. Once you have several bank accounts set up to store away your money, you will need to save at least $2,000 to get started with this plan. We have plenty of tips on our Facebook, Twitter, and Instagram pages to help you find extra money for saving. But if you already have more than enough coming in every month to start, get going by placing at least $2,000 into your new emergency fund now. After you hit $2,000 in your emergency fund, the rest of your income goes into your checking account. After you hit $4,000 in your checking account, all of the money left over goes into your savings account. 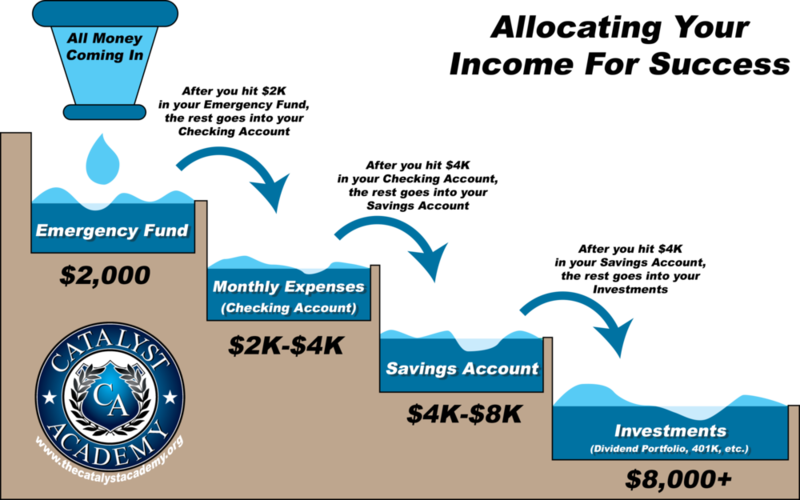 Finally after you hit $4,000 in your savings account, the rest goes into your investments. You can continue to repeat this method in order to build your wealth. Your checking account is used for bills coming in and other expenses, while the other accounts ensure that you will avoid the pitfalls of financial fragility. As soon as you have a good stash of cash, it would also be wise to incorporate a “pay off debt” account into the flow so that you can chip away at anything that is continuing to hold you back.